Today, Nicole Burke, of the Rooted Garden, asked me to do a takeover of her Instagram account. You see, we are both huge salad lovers. She installs beautiful kitchen gardens and teaches people in the Houston area to make their own salad gardens. You know, I am on a similar mission here, by encouraging you to garden and change the way you cook. So, in honor of this collaboration I have created the Rooted Garden Salad and topped it with the Best Dressing Ever - I promise. Just like seed starting changes the way you garden, making your own dressing changes the way you think about salad. The Rooted Garden Salad has to have roots - right? We have 3 types of radish growing now - stargazer, redhead and rat tail - and we will use all 3 in the salad. So, I headed out to the garden to gather the radishes, greens and herbs. I grabbed a fresh lemon off the tree too. Are you familiar with the rat tail radish? It is a crazy plant, being a true radish that is grown not for its root but for its seed pod. It is an enormous bee attracting machine that has taken over the middle of my garden. The seed pods can be eaten raw or cooked. My favorite way to eat them is raw on a salad, but you probably knew that already. When gathering the pods you just snip the largest ones and leave the rest of the plant intact. Easy - right? 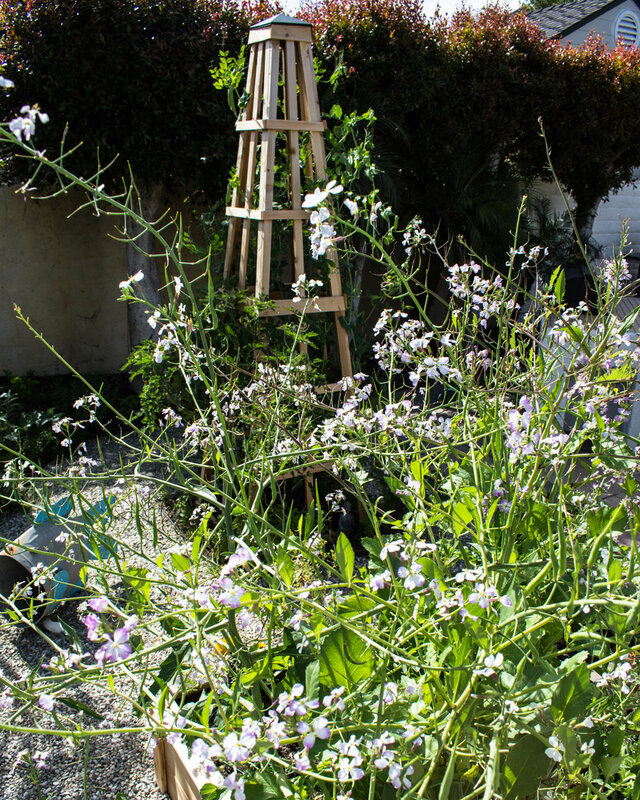 The rat tail radish is one big plant! Stargazer, redhead and rat tail seed pods. The stargazer radish, with its purple pigment makes a dramatic salad topper! The bean looking things are the rat tail radish seed pod. If you don't have access to them - no worries. Just throw in extra conventional radishes. To make the dressing, throw everything onto a blender and blend until combined. Pour into a lidded jar because there will be extra. The dressing stores well in the refrigerator - just give the jar a shake before using. 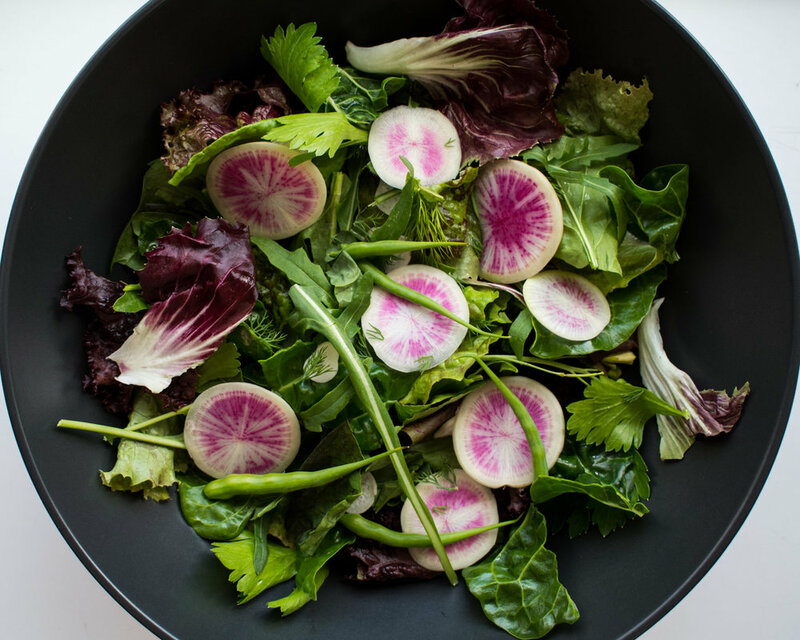 Mix the greens and herbs in a big bowl and top with radishes and seed pods. Serve tossed with dressing. Add additional salt and pepper if needed.